DESIGN: AGS-15/2 aerosol fire extinguisher generates dry aerosol cloud which extinguishes fire upon reaching necessary concentration in protected volume. AGS-15/2 aerosol fire extinguisher is a portable unit for operative use. AGS-15/2 is made in a shape of a low metal cylinder which has a nozzle gap around the side of the body. AGS-15/2 has a handle for its carrying and throwing into protected premise. AGS-15/2 has manual trigger starter unit which meets very strict safety and reliability requirements. OPERATION: AGS-15/2 portable aerosol fire extinguisher has a capsule trigger starter (type VUD) which is activated by pulling out the safety ring. 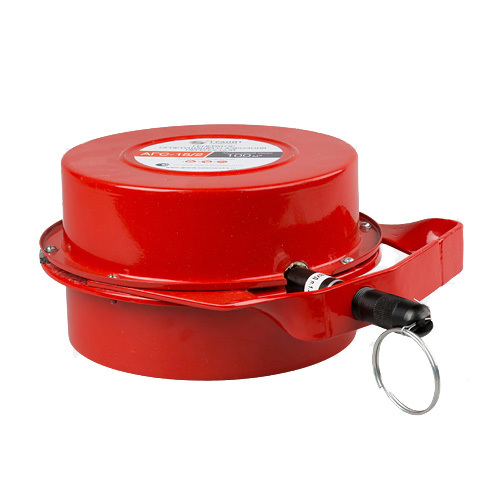 Fire extinguisher starts up with a delay 6-9 sec which is sufficient for its safe throwing into the area of fire. AGS-15/2 portable aerosol fire extinguisher can be thrown into the burning premise from outside through the doors or windows. Thanks to possibility of distant application the influence of dangerous fire factors on humans such as heat, smoke, the danger of caving and electric shock are reduced significantly or eliminated. APPLICATION: AGS-15/2 aerosol fire extinguishers have passed a wide range of tests and are recommended for use by firefighting crews, police or first responders on the public transport, in office spaces, other public and private premises, and households as very effective operative firefighting means. Thanks to its safety, simplicity and reliability AGS-15/2 aerosol fire extinguishers can be easily operated even by non-qualified personnel.